How much prior knowledge do the students have of the topic? 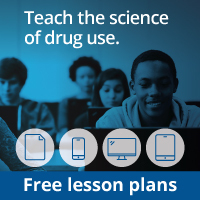 Do the students have misconceptions about drug use? Keep a record of questions the students raised while working on the module to refer to as they work on subsequent modules in the program. Below are some additional activities that can be used after the students complete the first mission. These activities are extensions to many other areas of the curriculum. Have the students make a list of the different contexts in which they find drugs mentioned. Possibilities include for medical use, as part of a criminal investigation, and in advertisements. Ask the students to take a poll of the adults they know, asking them what their opinion is of both legal and illegal drugs. Have them ask the adults to consider when they think drugs are helpful and when they are harmful. Finally, have the students ask the adults about both legal and illegal drugs, and their impact on society. Have the students write letters introducing themselves to the other group working on the activities in this program. Even though a competition is being set up between the two groups, encourage them to be polite and considerate in their letters.